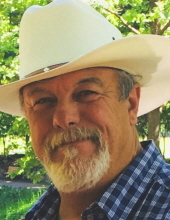 Leonard "Len" Monroe Hough, II, age 56, longtime resident of Osage County, passed away Monday, March 23, 2019 at his ranch near Fairfax. Friends and loved ones may pay their respects at the funeral home from 8am-8pm, Thursday, March 28 and Friday from 8am-1:50pm. A funeral ceremony to gratefully remember Leonard's life will be held at 2:00 pm, Friday, March 29, 2019 in the chapel at Trout Funeral Home & Crematory. Following the ceremony, he will be laid to rest at the Fairfax Cemetery in Fairfax, Oklahoma. Casket bearers will be David Hutchison, Joe Hightower, Buddy Bledsoe, Scott Gibson, Jesse Hough, and Brian Hough. Arrangements are under the direction of Trout Funeral Home & Crematory. Len was born on April 3, 1962 to Leonard Monroe Hough and Beverly Ruth Stanton Hough in Pawhuska. He was raised in Wynona, graduating from high school there in 1980. Following high school, Len went to work in the oil fields, and doing pipeline work. He traveled over much of the country to different oil fields as he worked. Along the way, he did some bounty hunting. Later, Len moved to Texas and began working on a ranch. For ten years, Len was with Ceja, doing seismic work. The last eleven years was spent ranching. Len loved hunting and fishing, almost as much as he loved his family. He was especially pleased when he could bring the two together. Some of his family were blessed by Len being the one to help with their first deer and fish. Spending time his nieces, nephews, and grandchildren brought him great joy. In 2008, he began dating his sweetheart Betty Hutchison, having blessed her with his love until his passing. Survivors include his adored wife Betty Hutchison of the home, beloved children: Billy Bouchard of Ponca City, Jessica Harman, Melissa McInroy and husband Mike of Junction City, KS, Jennifer Tiger of Ponca City, Rebecca Tiger of Ponca City, Kelly Dean LaRue of Ponca City, Shane LaRue of Ponca City; treasured grandchildren: Anna Bouchard, Lola Bouchard, Esme Bouchard, Brett McInroy, Bradley McInroy, Braxton McInroy, Mikaila Tiger, Kirsta Tiger, Nathen Tiger, Caesar Villarruel, Sergio Villarruel, Shaun Diamond and Kylee Diamond. ; cherished siblings: J. Gregory Hough and wife Shelby of Wynona, Brian Hough and wife Jill of Hominy, OK, Timothy Hough and wife Jennifer of Cleveland, OK, Chandra Hough of Wynona; dear nephews and nieces: J.T. Hough and wife Ashley, Morgan Hough, Destiny Hough, Jayde Hough, Ethane Hough, Ruthie Kay Hough, Clara Hough, Tara Hough, Easton Hough, as well as numerous great nieces and nephews. His girls Lady and Celeste. Memorial Contributions may be made to CASA of Kay and Noble County, 2203 N. Ash St.,. Ponca City, OK 74601. To send flowers or a remembrance gift to the family of Leonard Hough, please visit our Tribute Store. "Email Address" would like to share the life celebration of Leonard Hough. Click on the "link" to go to share a favorite memory or leave a condolence message for the family.